A slice through the interior of Jupiter shows the top layers that are depleted of helium and neon, the thin layer where helium drops condense and fall, and the deep interior where helium and neon again mix with metallic hydrogen. Drops of liquid helium raining down on Jupiter may explain the planet's odd lack of neon high up in its atmosphere, a new study suggests. Neon, a scarce gas in the upper realm of Jupiter's atmosphere, may be leeched out its original location by combining with condensed helium and then raining down to lower atmospheric levels on the gas giant, according to the science team behind the study. "Helium condenses initially as a mist in the upper layer, like a cloud, and as the droplets get larger, they fall toward the deeper interior," Hugh Wilson said, a post-doctoral fellow at UC Berkeley and co-author of the new study. Neon, which mixes easily with helium, dissolves in the helium raindrops, and together they fall to the interior of Jupiter. Wilson and colleague Burkhard Militzer, an assistant astronomy professor at Berkeley, used computer simulations to predict the link between Jupiter's missing neon and helium rain. Still, Militzer notes that the concept of rain as we understand it on Earth is an imperfect analogy for the process of helium rain on Jupiter. Under such conditions, hydrogen turns into a conductive metal, but helium does not. 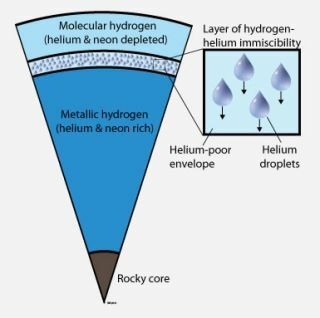 The helium instead separates from the metallic hydrogen and forms droplets — like drops of oil in water. The resulting rain essentially consists of liquid helium droplets mixed with neon falling through a liquid atmosphere of metallic hydrogen. As those droplets fall, the planet's upper layers are depleted of both helium and neon, which is consistent with measured concentrations that record low levels of both elements within Jupiter's hydrogen-rich atmosphere. The inspiration for Militzer and Wilson's research came from discoveries of neon depletion made by the Galileo probe that descended through Jupiter's atmosphere in 1995. That probe recorded measurements of temperature, pressure and elemental abundance before it was crushed under the weight of the immense atmospheric pressure of the gas giant planet. Helium rain has also been proposed to explain Saturn's excessive brightness and temperature. Saturn, a gas giant like Jupiter (but just one-third the mass), is slightly warmer than it should be based on the ringed planet's age and predicted rate of cooling. In this case, scientists think that falling helium rain releases heat, which would account for the warmer temperatures. Militzer and Wilson's predictions, which will be detailed in the March 26 issue of Physical Review Letters, will help refine models of Jupiter's interior, in addition to furthering the field of research concerned with modeling planetary interiors. The study will also provide relevant information for NASA's Juno mission to Jupiter, which is scheduled to launch next year.